A fourteen-track album can at times be overlong, a straight rock album should be the classic ten-tracks, forty-five minute assault of a joyous rampage. Here though that idea falls flat, the latest release by HERMAN FRANK is simply not long enough. The fourteen-track “Fight The Fear” is the perfect example of how to hit the listener in the face with tracks which are so intense that the listener practically begs for more. I was a fan of ACCEPT back in the day, so I had huge expectations here, however this like an extension of the elements that made ACCEPT so brilliant, fans of the same ilk will bathe in the raging beast that “Fight The Fear” is. The guitarist Herman Frank is on top-form, from the first ignition of “Until The End” the listener is brought on a journey of intense metal, old-school and melodic combined and the extra advantage of vocalist Rick Altzi of MASTERPLAN, the weapon of power in the band HERMAN FRANK, his vocals compliment perfectly the guitar playing, indeed the lyrics are the baby of Altzi, he is took that job earnestly and delivered skillfully. “Fear” keeps the pace solid while its intense second-half “Terror” has a walking, strutting guitar-crank, similar to nineties PANTERA but ultimately in the hands of Frank it is wholly unique, with vibrations of Doom-Metal. Though the riff that opens “Sinners” (included below) is a twenty-first update of how the genre is pushing forward with technology. This is an album of mind-blowing technique, with a wholesome depth and emotion that can at times become lost under the weight of trying to re-invent the wheel, it is not a necessity to be something new just play it as it is meant to be, that is where HERMAN FRANK stand tall. The numbers break free one by one, with the same raw-rage as the next, “Hatred” and “Hail & Row”-a song reminiscent of SABBATH’s “War Pigs” in it’s delivery though, wholly enjoyable. “Don’t Cross The Line” is immense, “Are You Ready” takes off with the same speed, this band never come up for air under their complete submergence in powerhouse metal. “Waiting For The Night” has the structure of Osbourne/Rhoads “I Don’t Know” from the “Blizzard Of Ozz” days, which is an important note as “Fight The Fear” is anchored in that very time. The air-guitars are dusted off well and truly by the time the finals track explodes with grace, “Lost In Heaven”. Some clean-picked electric-guitar leads into the albums only reflective moment. 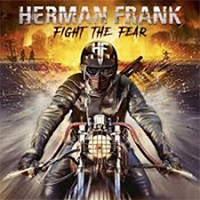 Not a ballad as such but simply a slower pace to, the listener will however be compelled to hit play again to let this album breathe, HERMAN FRANK both the band and guitarist have struck a moment of greatness here, hopefully they continue with more releases such as this.